solutions, today unveiled its newest memory card globally – the EVO Plus 256GB microSD card. The EVO Plus 256GB offers the highest capacity for a microSD card in its class, delivering fast speeds and an expanded memory storage for use in premium smartphones and tablets, 360-degree video recorders, action cameras, and drones. Consumers can now record up to 12 hours of 4K UHD video or 33 hours of Full HD video on their mobile device or action camera without needing to change or replace the memory card, allowing them to experience more and worry less about running out of memory. 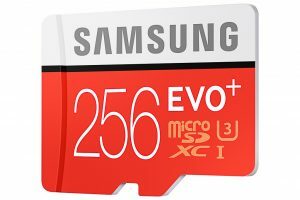 Samsung will offer the EVO Plus 256GB microSD card with a limited 10-year warranty in more than 50 countries, including the USA, Europe, China, and other regions starting in June 2016.